The Question:Hi! I have a dell m-5040 with windows 7 home premium, and am wanting to upgrade to windows 8 pro. I am only semi computer literate, but a fast learner, and i was wondering where i could find DETAILED STEP BY STEP instructions for what I need to do from start to finish to do this, esp about what to do with windows 7. I would like to have the option of uninstalling win8 and going back to win7, also, i don’t have any special or odd things on my computer, it is strictly for personal use, (email, games, etc) if you could point me in right direction, i would appreciate it!! The first thing you need to know is that an ‘Upgrade’ by its very nature completely replaces the previous operating system. Once you upgrade from Windows 7 to Windows 8 there is no easy way to go back to what you had previously; including all your installed programs, settings, etc. 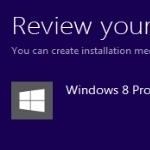 However, you can re-install Windows 7 over Windows 8 using Windows 7 installation media; either the original Windows 7 installation disc or download the ISO file and burn to DVD… same result. The main thing is that you must have a genuine Windows 7 product key, which you would have. Of course, a ‘clean’ install means you will be starting from scratch again with a fresh operating system. You will then need to re-install all your programs, setup email accounts, download updates, etc. Also, I believe most all Dell PCs include a recovery partition which can be utilized to restore the system back to factory settings (the way it was when you first got it). This would be the simplest, easiest method for you to go back to Windows 7 but, again, this will have you starting off from scratch with a fresh operating system. Or, if you wanted to go back to Windows 7 exactly the way it was immediately prior to performing the upgrade; you could first create a full system image of your Windows 7 installation, which would include installed programs, all settings and configurations, plus any personal data which is stored on the system drive (usually ‘C’ drive). In other words, a full copy of everything contained on the system (‘C’) drive. You would create the image and save it on external media, preferably an external hard drive. Then, if you don’t fancy Windows 8 and want to go back to Windows 7, all you need do is restore the image and… voila, back to where you started. So, although the upgrade process will erase the older operating system, you still have plenty of options that will get you back to Windows 7. Dave's Computer Tips Windows 7, Windows 8. permalink.